On 21 March 1918, General Ludendorff launched Germany’s massive Spring Offensive, “Kaiserschlacht” (Kaiser’s Battle), on the Western Front. The first phase, Operation Michael, involved thousands of troops, artillery, and poison gas, and the Germans quickly advanced deep into the British lines, causing catastrophic losses in both men and ground to the Allies. While the Canadian Corps was not directly affected by Operation Michael, the Canadian Cavalry Brigade and the Canadian Motor Machine Gun Brigade would soon be pulled into the chaotic fighting around Saint-Quentin. As the Germans hammered the British Fifth Army lines around Villers-Bretonneux during Operation Michael, the Canadian Motor Machine Gun Brigade (CMMGB) would quickly gain widespread attention during this critical period of the fighting. Along with the Canadian Cavalry Brigade, the CMMGB would be sent out to harass the advancing Germans and prevent a breakthrough at any cost. 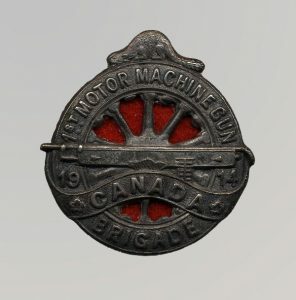 Collar Badge of the 1st Canadian Motor Machine Gun Brigade. Raised in 1914, the CMMGB was the brainchild of millionaire Raymond Brutinel, a former French army conscript and successful Canadian business man. Brutinel realised that mobile units, using the latest machine gun technology, would be important in the coming war, and worked to personally fund and supply the 1st Canadian Motor Machine Gun Brigade. The Brigade eventually grew to include the Eaton, Borden, and Yukon batteries, which were sponsored by more private funds, including the Eaton family and Klondike millionaire Joe Boyle. The Brigade was used sporadically during the first years of the war, and usually moved on foot, since trench warfare did not lend itself to the use of the armoured cars; however, as with the Canadian Cavalry Brigade, the situation that arose from Operation Michael was a perfect staging ground to demonstrate the use of armoured, motorised units. On 22 March 1918 the CMMGB was urgently sent from Vimy Ridge to support the besieged British lines around Villers-Bretonneux. Arriving with 40 machine guns and 8 armoured cars, under Lt. Col. W.K. Walker, the Brigade roamed the lines around Villers-Bretonneux, harassing the advancing Germans with automatic fire, passing messages, and rushing to fill gaps in the line (Nicholson, Canadian Expeditionary Force – 1914 – 1919, p. 371). Credit: Canada. Dept. of National Defence/Library and Archives Canada/PA-002614. For its part in holding the line, the CMMGB was praised in the Times, which noted that ‘everywhere they went they steadied the line’. General Sir Arthur Currie also commended the bravery of the Brigade in his message to Canadian troops in March 1918. The fighting at Villers-Bretonneux was not without cost for the CMMGB, which suffered 37 killed, 116 wounded, and 11 missing. 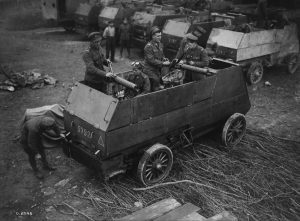 The success of the CMMGB led to the equipping of a second Motor Machine Gun Brigade in May 1918, and the two brigades continued to play an important role during the mobile warfare of the Hundred Days. Raymond Brutinel, a former soldier and mysterious figure, Brutinel emigrated to Canada before the First World War, living first in Edmonton and later Montreal. He made a fortune in agricultural speculation and used his political connections to advocate for the formation of a motorised machine gun unit at the outbreak of the war. Brutinel was promoted to Brigadier-General of the re-organised Canadian Machine Gun Corps in 1918.